Dr. Stephen Myers, 58, of Christianburg, Virginia passed away July 6 after his small single engine airplane crashed after what looked like a problem with the plane. An eyewitness reported in the news that there was a clanging noise and the airplane circled a couple times before the crash. 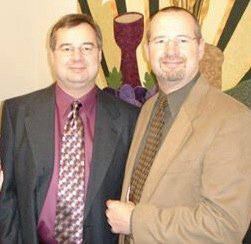 According to Dr. Scott Myers, his identical twin brother, Steve was an experienced pilot and was certified and his plane was instrument rated and certified. In the initial investigation, there was no malfunction found in the plane, nor was there any medical issues found. Until more investigation turns up something, the crash is a mystery and a terrible tragedy. Steve and his twin brother grew up in La Harpe and according to his brother Scott they enjoyed one of the best educations in the La Harpe School system. They both were on the wrestling, golf, and cross country teams, took part in musicals and plays including Bye Bye Birdie and Up, Up and Away. Steve played the baritone in the band and Scott played the trombone and they graduated from La Harpe High School in 1974. The boys continued college with Steve becoming a top notch dentist and community man in Virginia, while Scott became a top notch Orthopedic Surgeon and is now Chief of Orthopedics and part time teacher at the University of Florida. Scott said the visitation was overwhelming to see the impact his brother has had on so many people in the community. There was a steady flow of friends clear out in the parking lot for over three hours, he said. The stories were tremendous. The Myer twins were born in Peoria hospital and adopted by Dr. Myers and his wife who was the La Harpe dentist at the time. They lived in the brick home where Dr. Steve Rodeffer and Paula now live after Rodeffers bought the Myers' home and dental business around 1980 so Dr. Myers could retire and move to Macomb. His twin brother Scott wrote a tribute for his brother and agreed to share it with the readers of the Quill. Let me start with saying that Stephen was one of the most kind and unselfish souls I have ever known. He always had time for you. People were important to him. Whenever I would call he always stopped what he as doing and would talk, even though he was often busy. I thought he took the time because I was his brother, then I discovered that this is how he treated every one. Steve had figured it out. I can't begin to tell you how many people, last evening at his visitation, told me how Steve had truly impacted their lives. How he would joke with them when they were in his chair at the office and take their anxiousness away. How he would pray with them both in and out of his office. How he would care for them spiritually as well as what they needed in the dental chair. I was told of countless times when he gave care, knowing he would not be repaid. There was story after story of how Steve helped people when they needed it the most. He had a wonderful ability to do that. Of how many lives were changed and helped by his caring and support when they needed it the most. And Steve did it effortlessly and unselfishly. He was a lot like our Dad, who was also a dentist. Everyone's lives he touched liked him, Again one of those good souls. Steve loved his community and he loved his family. All of us are in a little better place and are better people because we knew Steve. If we had more souls in this world like Steve, the world would be a much better place. I'll end with what Steve always said to me when we finished our conversations; " I love you brother". The late Dr. Stephen Myers stands at left with his identical twin brother and friend Dr. Scott Myers of Florida.